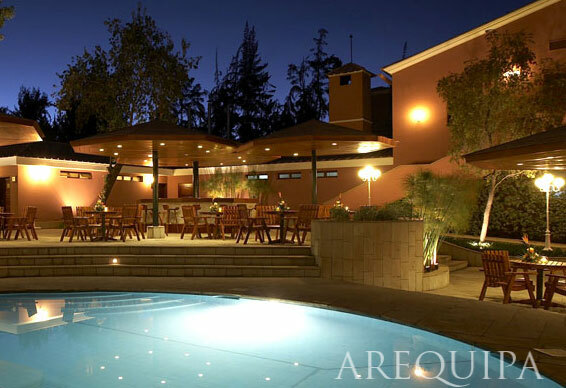 Sorrounded by trees and with an impressive view of the Misti volcano, Libertador Ciudad Blanca Arequipa is the perfect choice for you to make the most of your stay in the only five-star hotel in the city. We have the privilege of being in a peaceful and centric place at the same time, just minutes away from the main Square and the main attractions in the city. Our 88 rooms are spacious, comfortable and have been elegantly decorated so that you may enjoy a pleasant stay. All of them are equipped with air conditioning, heating, safe deposit box, cable tv, mini bar, hair dryer, laundry, 24-hour room service and wireless internet access (no charge for laptop users). Los Robles restaurant offers the best selection of the local food and also a fine variety option of international cuisine. We offer you a fitness room with sauna and Jacuzzi, where you could have relaxation moments. Our conference rooms have capacity for 50 to 250 persons fully equipped, and for bigger events we feature the Selva Alegre Terrace, with capacity up to 600 persons.